Teddy D. Rhodes, 72, of Vandalia, Illinois, passed away Tuesday, October 10, 2017, in Vandalia, IL. Private Celebration of Life Services will be held at a later date. Memorials: To the Family. He was born August 23, 1945, in Ramsey, IL, the son of Glen Clifford & Josie Lenora (Williams) Beck Rhodes. Married Rhonda Lynette Harris on March 4, 1967 in Ramsey, IL. 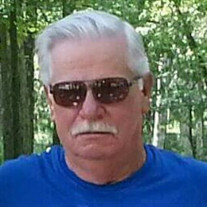 Teddy was retired from Imco Container Corp., Vandalia, IL and was affiliated with the Baptist Faith. He is survived by: Wife - Rhonda Rhodes, Vandalia, IL; Daughter - Leesha Swafford & Tom, Decatur, IL; Grandchildren - Dyllan, Tommy Jr. & Josie; Great Grandchildren - Airalyn, Sofia, Zoey & Zachary; Sisters - Florence Brown, Ramsey, IL; and Ada Dively & Scotty, Center Point, IA. Preceded in death by: Parents; Son - Nicky Dean Rhodes; 6 Brothers - Clyde Beck, Oral Beck, Donald Rhodes, Jerry Rhodes, Darryl Rhodes and Nelvin Sloman; and 4 Sisters - Lenora Sefried, Fredia Rine, Nancy Cook and Betty Rhodes.